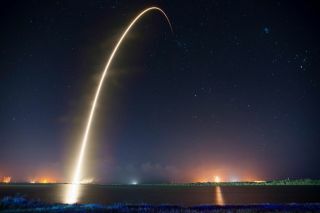 The predawn launch of a commercial SpaceX Falcon 9 rocket from Cape Canaveral Air Force Station in Florida on Tuesday, Jan. 6, may be visible to observers along the Eastern United States. Shown here, a SpaceX Falcon 9 launches the company's Dragon cargo ship to the International Space Station for NASA on Sept. 21, 2014. Update for Jan. 9: SpaceX's Falcon 9 rocket launch has been rescheduled for Saturday, Jan. 10 at 4:47 a.m. EST (0947 GMT). The launch webcast will begin at 3:30 a.m. EST (0830 GMT). Early-bird skywatchers along the eastern United States have an opportunity, weather permitting, to see the private spaceflight company SpaceX launch a robotic Dragon capsule to the International Space Station before dawn tomorrow (Jan. 6). The Dragon space capsule will launch into orbit atop SpaceX's Falcon 9 v1.1 rocket at 6:20 a.m. EST (1120 GMT) tomorrow from Florida's Cape Canaveral Air Force Station. As was the case with NASA's space shuttle launches to the station, tomorrow's launch will travel nearly parallel to the U.S. East Coast. That means the glow from the Falcon 9's engines should be visible in varying degrees along much of the Eastern Seaboard. You can watch the Dragon launch in live webcasts provided by NASA TV and SpaceX. NASA's webcasts will begin at 5 a.m. EST (1000 GMT), with SpaceX's webcast beginning at 6 a.m. EST (1100 GMT), about 20 minutes before liftoff. The official weather forecast continues to show a 60 percent chance of favorable weather for the launch of SpaceX's Falcon 9 rocket from Cape Canaveral.The primary concern is with thick clouds over Florida's Space Coast at launch time. A cold front will pass over Central Florida today (Jan. 5), bringing moisture to the area. If the launch does not occur tomorrow, the next launch opportunity is scheduled for Friday morning (Jan. 9). The upcoming Dragon launch is SpaceX's fifth commercial cargo mission to the International Space Station for NASA. The company also hopes to test an innovative reusable rocket technology during the launch that aims to land the Falcon 9 rocket's first stage on a floating ocean offshore platform in the Atlantic Ocean. SpaceX has a $1.6 billion deal with NASA to make 12 such flights. Last September, NASA also picked SpaceX to fly astronauts to the space station by 2017 using a manned version of the Dragon spacecraft. Depending on the location you're viewing from, the Falcon 9 might become visible anywhere from just a few seconds after launch up to perhaps 3 minutes after it leaves Cape Canaveral. After the first stage shuts down, the rocket will put out only the light from its single second-stage engine. At that time, the Falcon 9 should appear as a small, pulsating, fast-moving star that will shine with a yellowish-orange glow. People who remember sighting the brilliant glow of the space shuttle as it raced along the Atlantic Seaboard on its way to orbit may be disappointed when looking for the Falcon 9. Still, it might be worth the attempt to try to see what might be seen. Depending upon your distance from the coastline, the SpaceX rocket will be relatively low on the horizon — 5 to 15 degrees. (Your clenched fist held at arm's length covers about 10 degrees of sky.) If you're positioned near the edge of a viewing circle, the rocket will barely come above the horizon and could be obscured by low clouds or haze. If the weather is clear, keep in mind the Falcon 9 likely will appear to move very quickly, much more quickly than an orbiting satellite, due to the rocket's near-orbital velocity at low altitudes (30 to 60 mph, or 48 to 97 km/h). It basically travels across 90 degrees of azimuth in less than a minute. And, of course, before you head out to look for the rocket, make sure it has actually left the launch pad. Live coverage of the launch will be available here at Space.com, courtesy of NASA TV. Editor's note: If you capture a photo of the SpaceX rocket launch from your location on the U.S. East Coast, let us know. You can send images and comments in to managing editor Tariq Malik at: spacephotos@space.com.